Rodent models engrafted with human immune cells are important tools for preclinical evaluation of immunotherapies. However, humanized immune system (HIS) models have largely failed to support the long-term engraftment and survival of human natural killer (NK) cells, an immune cell population that is essential to an increasing number of cancer therapies being developed. This was a significant barrier to progress in preclinical immuno-oncology research. In their latest work, Central Institute for Experimental Animals (CIEA) scientists describe the long-term maintenance of human NK cells in human IL-15 transgenic NOG (hIL-15 NOG) mice. These new findings support the hIL-15 NOG mouse as an important breakthrough model that enables pre-clinical evaluation of NK cell-based cancer immunotherapies. Super-immunodeficient rodent models, like the CIEA NOG mouse®, support the engraftment of human tumors and functioning human immune cells through several distinct approaches. These tumor-engrafted HIS models are now routinely used in preclinical evaluations of T cell-dependent cancer therapies, including checkpoint inhibitors, chimeric antigen receptor T (CAR-T) cells, and T cell-engaging multi-specific antibodies. While T cells remain central to many ongoing immuno-oncology efforts, scientists increasingly are adapting T-cell methodologies toward other immune cells types, such as NK cells. Examples include NK cell-engaging multi-specific antibodies and genetically engineered NK cells with enhanced tumor-killing properties, like engineered CAR-T cell treatments. Often, several distinct HIS models are suitable for in vivo studies of human T cell-based cancer therapies, but this is not true for NK cell-based treatments. This is because standard immunodeficient rodent models lack essential human cytokine signals necessary for human NK-cell engraftment and survival. A HIS model capable of supporting the long-term maintenance of human NK cells would eliminate an important roadblock to the translation of NK cell-based cancer immunotherapies. In their latest work, CIEA scientists report that human NK cells, freshly isolated from peripheral blood or expanded in vitro, are maintained long-term upon engraftment in hIL-15 NOG mice. The engrafted human NK cells retain key immunological features and can respond to monoclonal antibodies (mAbs) to mediate antibody-dependent cellular cytotoxicity (ADCC) against an engrafted tumor. This work establishes an initial framework for pre-clinical evaluation of NK cell-based cancer immunotherapies in hIL-15 NOG mice. Central to the CIEA study is interleukin-15 (IL-15), a cytokine that is indispensable for the differentiation, function, and survival of NK cells. Without human IL-15 (hIL15) present, human NK cells that were injected into NOG mice failed to thrive and disappeared within one week. Remarkably, similarly-engrafted human NK cells expanded over their initial five weeks in hIL-15 NOG mice, a NOG mouse with transgenic expression of hIL15 cytokine. 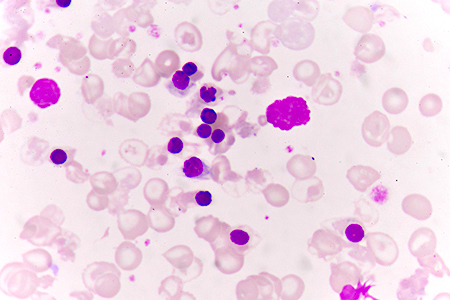 These engrafted NK cells remained detectable in circulation through the completion of the study, twenty-four weeks after their original injection. NK cells used in the initial hIL-15 NOG experiments were sourced fresh from human peripheral blood (huPB). When fresh huPB-NK cells were compared to huPB-NK cells expanded for 6-8 weeks in hIL-15 NOG mice, the in vivo-expanded NK cells maintained key immunological surface antigens and transcription factors while demonstrating favorable levels of two key cytolytic molecules, granzyme A and perforin. Not all results were favorable for huPB-NK cells expanded in hIL-15 NOG mice. Within in vitro assays, expanded huPB-NK cells displayed reduced cytotoxic activity compared to fresh-sourced huPB-NK cells. Furthermore, without mAb treatment, huPB-NK cells attenuated myelogenous leukemia tumor growth in hIL-15 NOG, but failed to mediate a tumor-inhibiting ADCC effect on CCR4+ lymphoma xenografts, following administration of an anti-CCR4 mAb. In further analyses, CIEA scientists explored the utility of an alternative human NK-cell source. Instead of freshly-isolated cells, human NK cells were expanded in vitro prior to engraftment. Adapting a clinical cell therapy approach, human NK cells could be expanded as much as 4000-fold in vitro. Similar to freshly-isolated huPB-NK cells, in vitro expanded human NK (ivE-NK) cells were maintained in hIL-15 NOG mice, although multiple administrations were necessary to maintain cellularity. Importantly, ivE-NK cells displayed enhanced cytotoxic activity compared to freshly-isolated huPB-NK cells, following engraftment in hIL-15 NOG mice. In xenograft studies, relevant mAbs induced ivE-NK cells to mediate tumor-inhibiting ADCC effects on CCR4+ lymphoma and Her2+ gastric cancer cells. Researchers developing NK cell-based immunotherapies now have an in vivo model to support the translation of their work. The hIL-15 NOG mouse should provide an adequate preclinical system to study engineered NK cells and their tumor-killing properties. Furthermore, the CIEA studies suggest ADCC-mediated tumor killing by mAbs and novel NK cell-engaging antibodies can be studied in hIL-15 NOG. In this study, freshly isolated huPB-NK cells lost some cytotoxic activity after engraftment in hIL-15 NOG. They also appeared unable to mount a mAb-induced ADCC response against an engrafted tumor. These data suggest that constitutive expression of hIL15 cytokine can alter the normal function of human NK cells in the model. This should be an important consideration for investigators planning to maintain and evaluate their own engineered human NK cells in hIL-15 NOG mice. For tumor efficacy studies, the tumor source is always an important consideration. This study used several cancer-cell lines with varying responses to engrafted NK cells. CIEA scientists observed strong tumor-growth inhibition in K562 gastric cancer cells without mAb treatment (NK cells only) in hIL-15 NOG. By contrast, engrafted NK cells did not diminish L428 lymphoma cell growth in hIL-15 NOG until a relevant mAb treatment was applied, though this ADCC effect only occurred with the ivE-NK cell approach. Although a mAb-induced ADCC effect against K562 cells was not explored in this work, their acute sensitivity without mAb treatment could be refractory to visualizing an ADCC effect. Alternatively, if an NK cell-engaging molecule were to actively recruit NK cells to the site of K562 tumors, the increased local NK-cell presence would be expected to further antagonize tumor growth. In this situation, teasing out non-specific killing vs ADCC-mediated killing could be challenging. Thus, therapeutic mechanism and intrinsic tumor-cell properties should be key factors that guide xenograft-tumor selection. The NK-cell source will be an important consideration for hIL-15 NOG studies. Fresh NK cells from PB (perhaps the simplest source for NK cells) did not perform as expected in hIL-15 NOG, but in vitro expanded NK cells were able to mediate appropriate ADCC effects. The extent to which protocol differences explain the differential effector capabilities illustrated by the NK cell sources in this study remains unclear. Nevertheless, the ability to expand human NK cells in vitro 4000-fold, while maintaining their in vivo functionality, should be enabling for many types of studies. A final consideration for adapting hIL-15 NOG to many in vivo studies will be determining an appropriate number of NK cells to engraft. In the CIEA study, in vivo NK-cell expansion and long-term maintenance depended on the NK-cell source. The investigators also irradiated hIL-15 NOG mice prior to engraftment, which is expected to enhance engraftment, but may not be necessary under some or most circumstances. Pilot studies focused on defining an engraftment protocol and kinetics of human NK cells in hIL-15 NOG mice will help guide downstream applications.